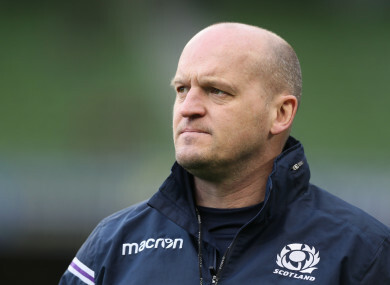 SCOTLAND HEAD COACH Gregor Townsend has named the uncapped trio of Sam Skinner, Sam Johnson and Blade Thomson in his 40-strong Scotland squad for the autumn Tests. Exeter second-rower Skinner is a former England youth international, while Scarlets number eight Thomson has represented New Zealand’s U20s. They join Glasgow centre Johnson in the 40-man group named ahead of next month’s clash with Wales in Cardiff and three Murrayfield Tests against Fiji (10 November), South Africa (17 November) and Argentina (24 November). Scotland’s most-capped player Ross Ford has won a recall as he looks to build on his 110 appearances for the national team. But Stuart Hogg, Zander Fagerson, Richie Gray, Duncan Taylor and Tim Swinson miss out through injury. We now begin the last 12 months of our preparations for Rugby World Cup 2019 with four Test matches in four weeks, a similar challenge to the one we’ll face in Japan,” said Townsend. Players not considered due to injury: John Barclay, Mark Bennett, Lewis Carmichael, Cornell du Preez, Zander Fagerson, Richie Gray, Stuart Hogg, Tim Swinson, Duncan Taylor. Email “Ex-England and New Zealand youth internationals included in Scotland squad ”. Feedback on “Ex-England and New Zealand youth internationals included in Scotland squad ”.